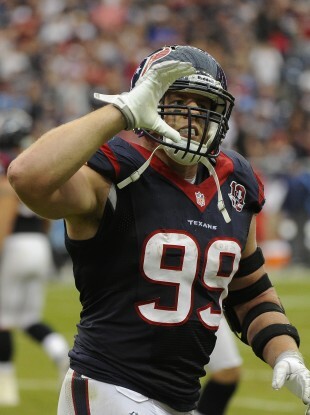 Machine: JJ Watt of the Houston Texans. The Atlanta Falcons are the last undefeated team in the NFL and, without a running game to speak of, most of the thanks must go to Matt Ryan. The fifth year QB out of Boston College has 17 touchdowns to just six interceptions and his completion percentage of 68.9% ranks third in the NFL. As tempting as it is to put Doug Martin in here after his 251 yard, four touchdown performance last night, the award has to go to the Viking’s star in the backfield. Peterson leads the way in yardage (957), yards per game (106.3) and is fourth in yards per carry with 5.7. All this as he comes back from what was considered a career threatening injury. It doesn’t appear as if ‘The Gronk’ is having as much of an impact as he did for the Patriots last season but he still has 580 yards and seven touchdowns on 43 receptions. His run blocking has also significantly improved the previously tepid New England rush attack. Andrew Luck wouldn’t have a winning record this season if it wasn’t for the league-leading 835 receiving yards of Reggie Wayne. The veteran has hauled in 61 of 101 passes, including 44 for first down. Wayne is also the only receiver in the NFL averaging over 100 yards per game. All the talk before the season started surrounded Peyton Manning and his reconstructed neck. Could the veteran QB survive the pounding NFL defences regularly hand out. The answer is that we still don’t know for Manning the Elder has been sacked just 10 times this season and the protection afforded by his offensive line has allowed him to be the most accurate quarterback in the NFL with 69.5% of his throws finding their target. Wait, how can one player win a team award? Well, when that one player has sacked the opposing quarterback more times (10.5) than two teams (Jaguars and Eagles) have managed, you know you’re dealing with a special player. Watt is the defining defensive lineman of his generation and on course to being the greatest defensive end of all time. Nine sacks and four forced fumbles on the year make Ware the obvious choice at outside linebacker. Yes, he has given away some stupid penalties this season but his 37 tackles put him just ahead of Clay Matthews for me. It’s just a pity he can’t play offense for the Dallas Cowboys or they might have a chance to make the playoffs. The Arizona Cardinals inside LB has a massive 64 solo tackles this season already. He has also sacked opposition quarterbacks eight times, batted down a pass and forced two fumbles. The Cardinals season may be going down the drain, but Washington remains a shining light. Tillman wins this award almost solely for his performance against Calvin Johnson and the Detroit Lions when he held the superstar receiver to just three catches for 34 yards on twelve targets. Tillman also has two interceptions, both of which he has returned for touchdowns, seven forced fumbles and 43 tackles. Reed may be aging but he has still managed 35 tackles, defended ten passes, intercepted three more and recovered a fumble. Not bad for an 11 year veteran, especially in a patchwork Ravens defence. Email “The Redzone: NFL mid-season awards”. Feedback on “The Redzone: NFL mid-season awards”.